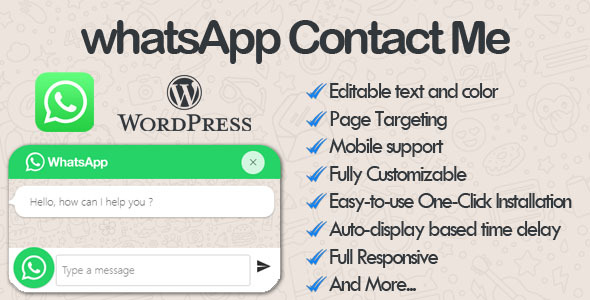 Chat with your customer on whatsapp on your website with the whatsApp Contact Me plugin. With WhatsApp Contact Me, it automatically extracts messages to help your customers enter your site, so your customers can connect with you directly to whatsapp and learn about their phone numbers. Note ! : After logging in to the Admin Panel you can set “Whatsapp Contact Me” under WordPress settings. This entry was posted in add-ons, expressionengine, plugins and tagged whatsapp chat, whatsapp contact, whatsapp support on site, whatsapp support wordpress, wordpress whatsapp, WP Whatsapp by dadmin. Bookmark the permalink.